This project originally appeared in the Seattle Post-Intelligencer in September 2008 and was nominated for a Pulitzer Prize. 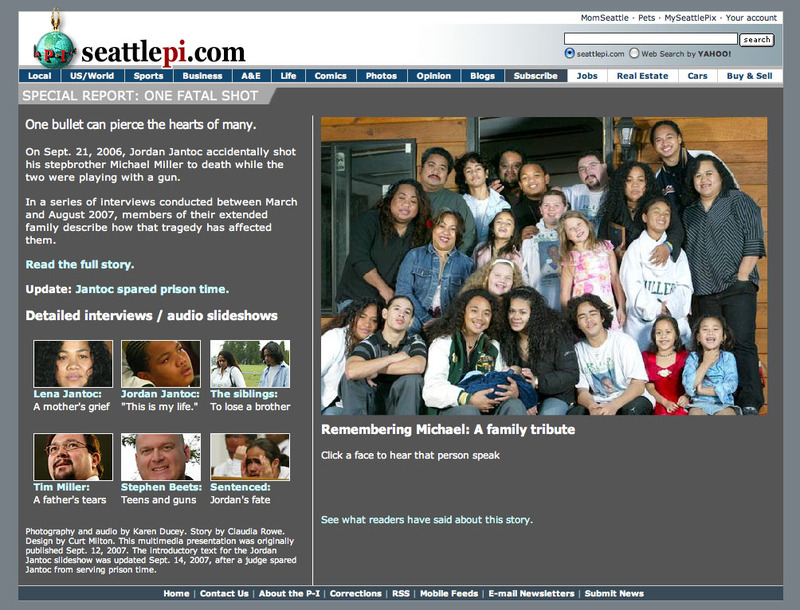 It is no longer active on the Seattle P-I website but can be viewed at the links on your left. On a late September evening in 2006, while showing it off to his siblings, Jordan accidentally shot and killed his brother and best friend, Michael. The tragedy sent Jordan’s close-knit family on an unusual journey of grieving; mourning the death of one son, while facing the possible loss of another to state prison for up to 8 years.. In 2008 Ducey’s project “One Fatal Shot” was selected as a finalist in ASNE’s community service photojournalism award , finalist for a DART award for excellence in Coverage of Trauma, runner -up for a Casey Medal in the multimedia category, placed in the NPPA Best of Photojournalism domestic picture story category and nominated for a Pulitzer Prize.